The Stelvio reaches U.S. dealerships next month. NASHVILLE, Tennessee -- Alfa Romeo’s global brand chief says he won’t cut prices to meet lofty U.S. sales goals, because he insists Fiat Chrysler Automobiles isn’t setting such targets in the first place. The absence of set objectives is a rarity for Reid Bigland, who’s also head of U.S. sales for all of Fiat Chrysler. His focus is on building out Alfa Romeo’s dealer network and reestablishing the brand in the U.S. as a true luxury name, with the Stelvio crossover about to join Giulia sedans in showrooms. FCA CEO Sergio Marchionne’s deputies are accustomed to taking aim at ambitious forecasts the boss has made public over the years at regularly held releases of five-year plans. With Alfa Romeo, the company has to balance the opportunity for expanding volume with the need to keep consumers thinking its models are worthy of fatter sticker prices than the Dodges or Chryslers elsewhere on dealer lots. “It’s a completely different game, with the two games really not to be confused,” Bigland said. With the Stelvio reaching U.S. dealerships next month and joining the Giulia and the 4C coupe, Alfa Romeo will have just three models for U.S. customers. Audi has that many SUV lines alone. Luxury leaders Mercedes-Benz, BMW and Lexus have even more. Gaining ground against these established giants won’t come easy, said Joe Phillippi, a Short Hills, New Jersey-based auto industry consultant. “Sergio’s got his own set of expectations which usually don’t come to pass and then the poor guy that was assigned to manage it gets the boot,” Phillippi said in a phone interview. Alfa Romeo intends to challenge German and Japanese brands with Italian design, a deep racing heritage and powerful engines. The first Stelvio models will be powered by a 2.0-liter, aluminum engine that delivers 280 hp and 306 pound-feet of torque. Coming later will be the faster Quadrifoglio version with a 505-hp, 2.9-liter engine. “I don’t think anything will touch it,” Bigland said. The Giulia and Stelvio are built on the same platform, called Giorgio. It makes extensive use of lightweight materials, including magnesium and carbon fiber, helping maintain a 50-50 distribution of weight from front to back. “We have to give the customers content to conquest,” said Pieter Hogeveen, Alfa Romeo’s North America chief, while highlighting standard leather interiors, bi-xenon headlamps, genuine wood and aluminum accents and painted brake calipers. Alfa Romeo should have about 215 dealers in North America by the end of the year, up from the current 184, Bigland said. That compares with about 2,400 mainstream Chrysler, Dodge, Jeep and Ram dealers. About 60 of the Alfa Romeo stores in North America are housed with Maserati outlets. Bigland said the pairing of the two high-end Italian sports-car brands makes some markets viable where neither could support a single-brand store. 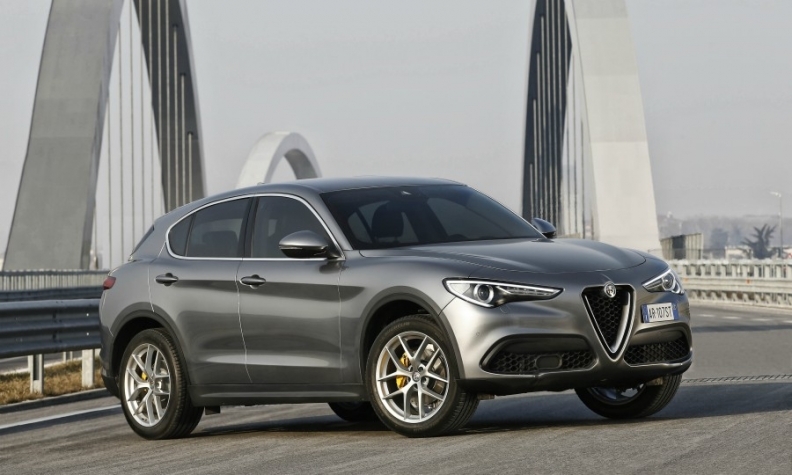 The two brands may combine for a total of 230,000 vehicle sales worldwide this year and Alfa Romeo may deliver profits as soon as the fourth quarter, Marchionne said in April. With the expansion of the dealer network and lineup, Alfa Romeo is starting to increase sales. After selling 1,106 cars in North America in the first quarter, Bigland sees that figure topping 3,000 in the three months that end next week. FCA has been bold in its assessment that consumer tastes have permanently shifted from sedans to SUVs. The company killed off mainstream sedan models in the U.S. to free up more capacity for pickups and Jeeps. Now, the Stelvio is entering a midsize segment that makes up a quarter of the 2.1 million premium vehicles sold in the U.S. last year. “We feel we’ve got the right product for the right time,” Bigland said.